Discovering a new country often happens through food, and the middle east has some delicious touristic claims in that department. 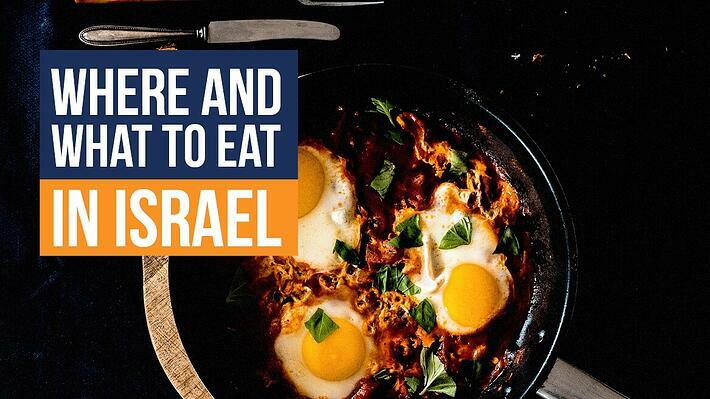 Israel, in particular, offers simple but filling and tasty meals. Not spicy, not oily, even pretty healthy, with many vegetarian options, everyone’s sure to find something to their taste. In fact, the complicated part is not to dig up a good restaurant, but rather to understand what’s on the menu. Here’s a little wander down delicious lane to help you find what to eat during your tours to Israel! The basis of most meals in Israel is Pita. This flat bread has to be eaten while fresh so you can enjoy the white, fluffy, delicious bread inside. You can eat Pita as a snack if you buy it on the street (warm or seasoned with herbs), but it’s also an essential tool for a sit down meal. A traditional meal in a restaurant will be some warm Pita with several small plates of salads and dips. Each guest usually have his own individual plate to sample and mix things to their taste. 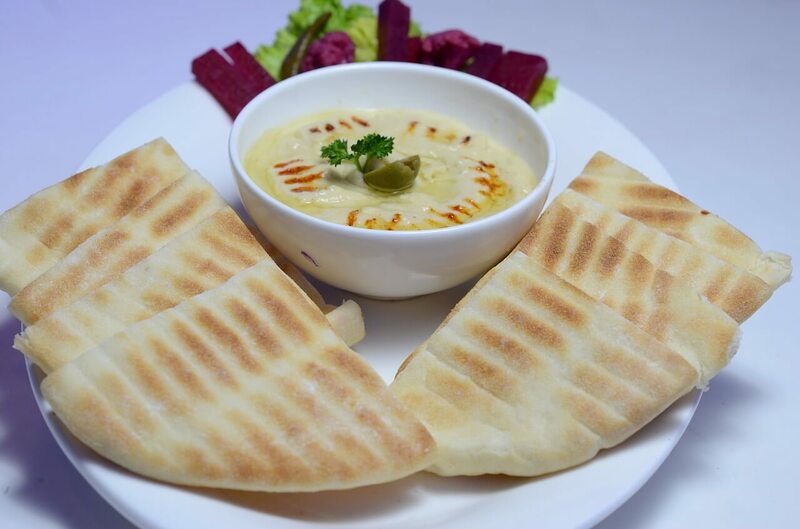 The Pita is used as cutlery to pick up the dip and accompany the salad. It’s totally okay to use your hands, so have fun with it! Several mouth watering dips are always available to spread on your Pita. The most popular is, of course, Hummus. This soft spread is everywhere in the Middle East, and no one’s complaining about that! Traditional Hummus is made with chick peas, oil and garlic, but you can also find it under many other guises and colors (orange with turmeric, speckled with sesame, green with aromatic herbs, …). One thing stays true: it’s delicious. The other staple in the dip department is Tahini, made from sesame. Between sugary and salty, Tahini is like peanut better, good for spreading or in a sandwich. The taste can be a bit strong at first try, but if you like sesame you’ll quickly become addicted! Lastly, the Baba Ghanoush is a dip made from baked eggplant and olive oil, with a strong Mediterranean feel. If you like eggplant, this will be delicious in a sandwich! Salads in Israeli cuisine are very strongly influenced by Mediterranean cuisine. No actual lettuce in those salads, but a fresh and delicious mix of tomatoes, cucumber, sweet corn, bell pepper. Tabbouleh is also available everywhere, and to each restaurant its own way of cooking it. This cold, filling, salad is perfect for a quick lunch or for taking out on a picnic: the lemon juice used to flavor it makes it last a long time outside of the fridge! Green olives, black olives, purple olives, they’re everywhere and it’s delicious. This ingredient flavors the air and most meals with its summery, mouth watering smell. If you don’t like olives, be prepared to change your mind! Dolma is a traditional dish that you can find in most restaurants. A combination of rice, lentils and meat are stuffed and rolled inside cooked grape leaves. The texture is a bit like sushis in the mouth, but warm. A perfect delicacy for cold nights! 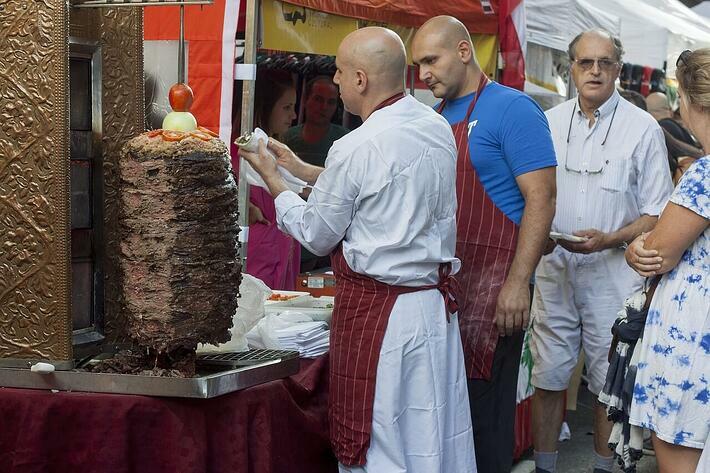 Shawarma is what many countries call a kebab (but a kebab in Israel is something else, don’t get confused). Meat or falafels are stuffed inside a pita with hummus or tahini sauce and a few vegetables, the perfect meal for on-the-go exploration! Falafels (round balls made of chick peas) can also be enjoyed on their own or with a light salad, it’s delicious anyway. Halva, a little crumbling pudding made of Tahini. Labane, a yogurt like dip to eat with a Pita (sometimes served for breakfast as well). Baklavas are small cakes containing nuts and usually dripping with honey, very filling! A Kadaif is a piece of flat dessert looking like an orange bird nest with a delicious sugary taste, also very filling, it’s the perfect snack. Restaurants are not what’s missing in Israel, especially in the cities of Jerusalem and Tel Aviv. In Jerusalem, you’ll find many touristic restaurants offering traditional dishes, but also an incredibly mouth watering Food Market. In Tel Aviv, you’ll find more modern fusion cuisine, but also good old traditional haunts. Everywhere in the country, don’t be afraid to try out restaurants and bakeries, there will always be something for you! You’ll come back from Israel with many souvenirs, to be sure, but it’s probably the taste of hummus and the smell of honey that will come back to you when you think back on your adventures. Rinse it off with some mint tea or a good Golan wine, it’s like you’re back there!